MMC connectors are made up of a rectangular insulation block and are available in ten different contact arrangements with 14 to 208 removable contacts. These contacts can be equally male or female contacts and are fitted with different types of wires and coaxial cables. Truly versatile with a broad range of contact arrangements and accessories, MMC connectors can be manufactured according to your exact specifications. 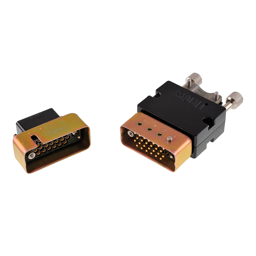 With the MMC series, Radiall offers highly adaptable rugged connectors that answer the majority of connection problems. Current rating: 13A max. (Wire AWG depending).